Mulch is like paint. Both are cheap ways to cover an ugly surface and give them a fresh look. Adding a layer of mulch minimizes time spent weeding and watering. If you need to refresh mulch around your property you can spend more than $4 per bag for two cubic feet (the average sized bag). If you're not particular about the type and color of mulch you put down, here are lower cost options. 1. 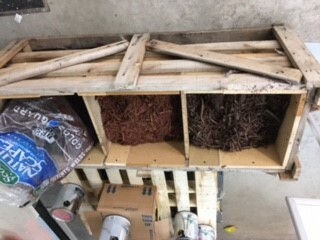 Habitat for Humanity ReStore (2700 Minnehaha Av., Mpls, 612-588-3820) just got in more than 1,000 bags of Scotts NatureScapes mulch in brown and red (pictured). They're selling it for $1.50 a bag (2 cubic feet). Note: ReStore is closed Sundays and Mondays. Most of the reviews online for Scotts mulch are positive, but the main criticism is that the color fades. The bag does not specify what kind of wood is being used. The ingredients list reads "forest products and colorant." Mills Fleet Farm normally sells a black mulch in this brand for $4.28. Fleetfarm.com shows it on sale for $1.99 per bag, but not in stock in the Twin Cities, according to the website. The $1.50 per bag is about as cheap as a person can buy it unless you want it free. 2. Free mulch is available for those who want to haul it themselves when city or county forestry departments trim trees. Check with your area's city or county offices to see where free mulch sites may be located. In Minneapolis, find a list of three sites for pickup here in the Marshall Terrace neighborhood, Lake Nokomis area, and Armatage Park. Note: the city of Minneapolis website indicates that the free wood chips program will be discontinued after July 2017. A rep at 612-313-7710 said that is outdated info. The program will continue at the three sites indefinitely, although there used to be eight sites. For a list of wood chip sites in other Twin Cities communities, try this link. One caveat, the list is more than a few years old and some numbers and sites will have changed.